Armed with a clipboard and a finely-tuned nose and taste buds, Craig Holt began the hard work of determining the potential of Burma’s coffee growers. 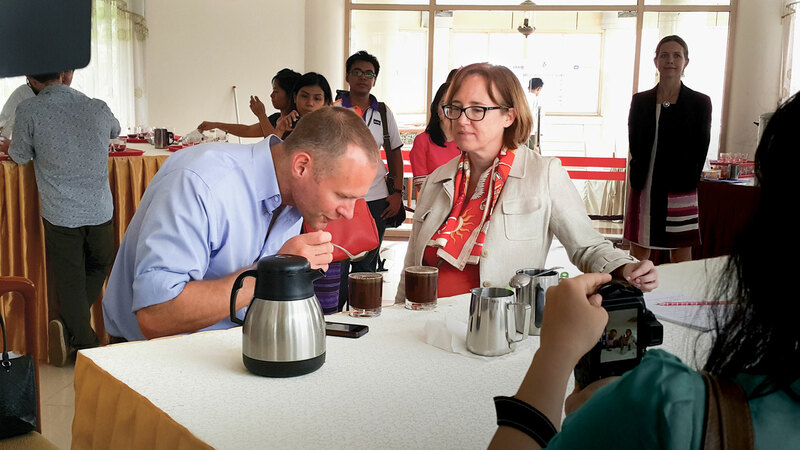 Holt, owner of Seattle-based Atlas Coffee Importers, was in Rangoon, Burma (also known as Myanmar) as a volunteer judge in the nation’s first coffee-cupping competition. Held in May 2015, the event was an opportunity for 58 mostly smallholder growers to have their coffees evaluated by industry experts to see if they had what it takes to be deemed specialty grade, a designation that would earn the farmers access to the global market. Atlas Coffee’s Craig Holt at a cupping event in Burma. Photo by Tim May. The cupping event was put on by Winrock as part of the USAID-funded Value Chains for Rural Development project (VC-RD), which began in 2014. A year earlier, the coffee world woke up to the potential of Burma’s beans after John Ogonowski and Doug Bereuter Farmer-to-Farmer volunteer Rick Peyser — a longtime executive at Green Mountain Coffee Roasters — visited the country and wrote an influential trade article about his experience. Peyser’s initial visit was followed by other volunteer trips and the initiation of the VC-RD program, which introduced improved production methods to thousands of small coffee growers. The new techniques, which included drying coffee beans on raised tables instead of the ground, made a big difference. “The growers were exceptionally willing to take the information they were given and not just absorb it, but expand and apply it instantly like no place I’ve ever worked with,” says Holt. That’s not just Holt’s opinion. A year after the Rangoon event, the first Burmese coffee beans made it to the United States, where they will be sold at Whole Foods Market and La Colombe Coffee Roasters in Washington, D.C. It’s not only American coffee lovers who will benefit. Access to lucrative international markets means higher income for Burmese growers, which translates into better housing, sanitation and educational opportunities. Obviously, Holt liked what he tasted in 2015. His company was the first to import Burmese coffee into North America.